Future musical archaeologists sifting through the detritus of the 1990s are likely to have an easy time fixing a date to what they find. With trends coming and going with revolving-door regularity, a certain kind of sampled sound or a particular synthesizer squawk can pin down the date of a pop record to within weeks. 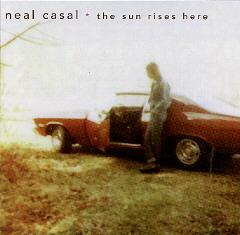 Neal Casal, however, is likely to confound fossil hunters. Someone unearthing the New Jersey singer-songwriters fourth release The Sun Rises Here, or indeed any of his previous recordings, is likely to label it: circa 1968-2028. The honest, unpretentious songs that inhabit this record might have come from any time in the past 30 years, and will likely stay fresh for another thirty. Casals secret to time-defiance is rather simple in principle, but rare in execution: good, literate, melodic songs with tasteful understated arrangements, sung by one of the most appealingly sincere voices youll likely hear. Interestingly, it was an early teenage Epiphany that set Casal on his path. Casal was fronting his own band by age 17, while working on writing and doing demo tapes. By 1991, his music attracted the attention of publishers, leading to a contract with Warner/Chappell Music. By 1994, he was signed to the BMG-distributed Zoo Records, which the following year released his critically-acclaimed Jim-Scott-produced debut Fade Away Diamond Time. The album arrived just at a time when there was renewed interest in guitar- and song-based Americana, with groups like the Jayhawks. But for Casal, it was just a natural outgrowth of his lifelong style. He may have been a child of the 80s but, All these years down the line, I am still very close to the music that I started out listening to, which was late 60s, early 70s rock & roll. Those influences were the ones that really stayed with me. The Stones he says, led him down stylistic paths to the country-rock of Gram Parsons, the reggae of Peter Tosh, and the blues of Mississippi Fred McDowell. With such august publications as the Washington Post calling Fade Away Diamond Time one of 1995s best, the future indeed looked bright for Casal. But Zoo Records was in the midst of downsizing, and the team who brought Casal to the label were among those let go. In December 1995, shortly after the release of his album and during the midst of a tour, Casal was one of several Zoo artists whose association with the label came to an end. After Casal returned home to reassess his recording career, a trip to the West Coast in February 1996 for sessions with Jim Scott and the Fade Away Diamond Time band was arranged, and some songs were committed to tape. (One of which, Midway was eventually released in 1997 on Field Recordings.) But at the time, the direction was not right for Casal. Instead, working with the independent label Buy-Or-Die Records, whose founder was one of his many fans, Casal made Rain, Wind and Speed with a small budget and only five days in the studio. It was a stark, largely solo record, with all the vocals and guitars recorded live. He calls the album one made out of survival. It was the only way I could move on after my departure from Zoo and the tour ending abruptly. In retrospect, he says, Theres a desperation on that record that I dont hear on all my other work. It amazes me that I finished it at all. But it showed how well Casals songs, stripped of all but the essentials, could still make their mark. Up close were his poetic, impressionistic lyrics (Casal cites Garbriel Garcia Marquez and Paul Bolles as literary influences), comfortably folky acoustic guitar, and above all those vocals that somehow seem to bare his soul through his disarmingly airy tenor. Meanwhile, in Germany, Reinhard Holstein, founder of Glitterhouse Records sought out Casal, after discovering that the followup to Fade Away Diamond Time, one of Holsteins desert island discs, was on a small independent label. Glitterhouse arranged to release Rain, Wind and Speed in Europe and in the spring of 1997, brought Casal to the Continent for a whirlwind tour. He soon discovered the generous reception given to literate singer-songwriters even in non-English-speaking countries. It was there that Casal met with Holstein with his amazing record collection of all these obscure American bands. But after a while, it dawned on me that Im also one of these obscure musicians myself. Glitterhouse commissioned Field Recordings, released in the summer of 1997, a fascinating collection of odds and ends from unreleased Jim Scott-produced gems to a basement recording of a 14-year-old Casal with his first band doing a cathartic Black Sabbath cover. Like Rain, Wind and Speed, some of Casals vocals were recorded live, but what overdubs were done were accomplished in a single night, eliciting some amazement from those in the studio. In addition to his own music, Casal is featured prominently on a new album with Smashing Pumpkins guitarist James Iha, (Let It Come Down) on which he sang harmony vocals on ten songs and played guitar on five. Produced by Casals old colleague Jim Scott, the album has a laid-back folky singer-songwriter direction that may surprise Smashing Pumpkins fans. A tour is planned. The Sun Rises Here is set for March 1998 release on Glitterhouse Records. Management: Gary Waldman, Morebarn Music.